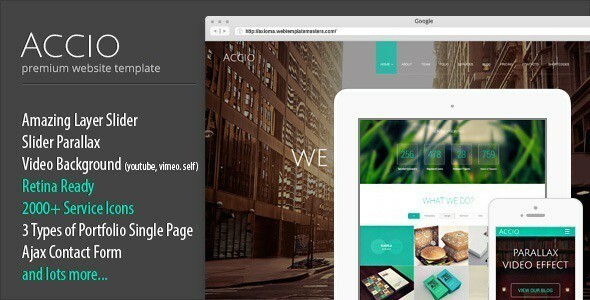 Accio is extremely easy to use and setup responsive one page Joomla template. Such a great number of awesome features are gathered in one template! It comes with Full Screen Layer Slider, Full Screen Parallax Slider and Full screen video YouTube Player. It has amazing combination of nice-looking design, multiple CSS 3 animations, stunning parallax effects and clean coding. Item Reviewed: Accio Responsive Parallax One Page Site Template 9 out of 10 based on 10 ratings. 9 user reviews.